Whether you need a new roof on your existing home or are re-roofing to include a room addition, we are the area's most trusted residential re-roofing team. Our licensed, professional roofers will work quickly, efficiently and with minimal disruption to your home life. We'll work with you or your contractor to achieve the quality final product you expect. We keep up to date on zoning laws, building permit requirements and homeowners association guidelines, so you can be sure to get the job done right the first time. 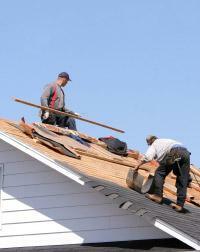 You can depend on our expert re-roofing services for your construction needs. Give us a call today for a free estimate on your next residential re-roofing project.